Important Notice: There are now three extra questions involving identification checks. These will appear on all medical questionnaires for pain relief products. Not submitting to these checks will mean that we cannot process your order. . You must agrees to these for us to process your order. 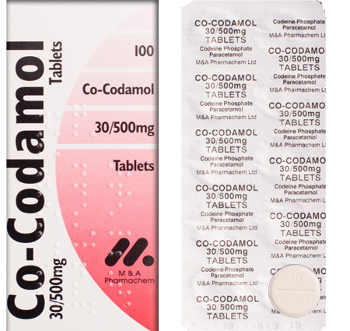 A widely-issued pain medication, Co-Codamol is a popular choice when it comes to treating moderate levels of pain. In many cases, it is the painkiller doctors issue when milder medicines (such as paracetamol alone or weaker NSAIDs) may not be suitable, or effective. This medication has been used to help those suffering with post-operative pain, injuries, headaches, toothaches, and various other forms of discomfort. It can help to reduce symptoms of fever as well. Very Helpful I have suffered from continual pain for several years. In the past, each time I needed a new refill, it required a trip to my physician. I have found this site to be very helpful. Quick and Efficient In dire need of some medication and was not able to see my GP for several more days. This service was quick and efficient and perfect for my needs. Excellent Service It is such a relief to know that I can rely on this site to provide me with the pain medications I need. The service is very well run and customer service is excellent. This product is a combination medicine, consisting of two central ingredients: codeine and paracetamol. Codeine, as an opioid category painkiller, is a more heavy-duty medicine that works by lessening the brain’s awareness of pain by releasing endorphin-like chemicals. Paracetamol is an everyday pain relief medicine that dulls the perception of the nerves surrounding the specific area affected. When you buy Co-Codamol online in the UK, lower dosages do not need prior consultation with a doctor. However, the higher-strength dose available here does require a prescription, which can be obtained via our secure consultation process. This medicine can cause side effects, and a doctor may refuse to issue it to patients at an increased risk of encountering these. Persons who are allergic to any containing ingredients should never use it, and those who suffer from certain medical conditions may also be unsuitable. Possible side effects include withdrawal, constipation, nausea and vomiting. For a more comprehensive list of restrictions and side effects, read the safety information provided. All of our items are shipped free of charge, by next day tracked courier. For weekday orders approved before 3pm, you can expect to receive your item by the following working day. We will never advertise your order for all to see. For your safety and privacy, all orders are dispatched in plain and secure packaging. Our easy-to-use consultation service enables you to buy pain medication online safely and legally. After you click to order, you will be given a medical questionnaire to complete. A doctor will assess your answers and review your suitability. If the doctor approves your order, they will generate an electronic prescription and pass this onto our UK-based dispensing pharmacy.